100% Satisfaction Guarantee. Includes Emergency Blanket. TravTac MOLLE Tactical Waist Pouch is the Perfect Compact Solution for Organizing and Carrying your Gear when Hiking, Camping, Hunting, attending Sports Events, going to School, or working Outdoors. The Versatile Small Tactical Waist Pack design allows you to configure your pack to carry it by strapping it over your shoulder, attaching around your waist, or simply hand carry it by the hand strap. 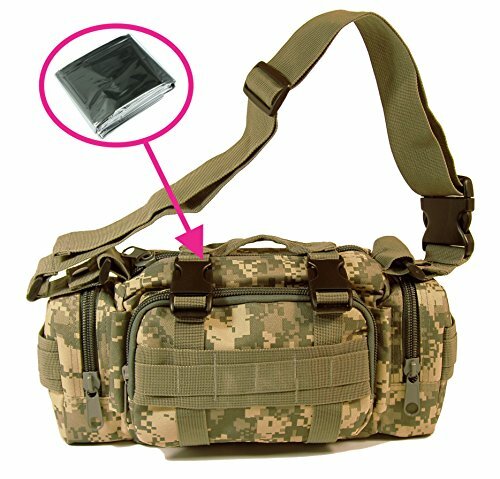 A generous number of dividers, straps, clips, loops, pockets, and snaps gives this MOLLE Compatible Pouch endless configurations for whatever your specific needs are.